Minna Rytisalo (photo by Marek Sabogal). Minna Rytisalo’s second novel Mrs. C rose straight to the top-ten bestselling list as it came out in September, first hitting #4 and then rising to #2 in October, the busiest month in Finnish publishing. Mrs. C is a story of a strong and independent-minded woman who gets her way in an era when the place of a woman was merely attending to the household and the children (read more about the book here). The novels themes got some extra attention at the Turku book fair in the beginning of October when the President of Finland, Sauli Niinistö, ended up demonstrating Finnish equality: he was sitting on the stairs of the over-crowded hall listening to the discussion on equality between Rytisalo and the President’s wife, poet Jenni Haukio, and a couple of other panelists. 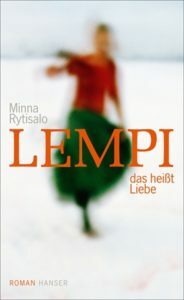 Rytisalo’s debut novel’s German edition by Hanser (2018): Lempi – das heißt Liebe (‘Lempi – that Means Love’). Minna Rytisalo’s debut novel Lempi (2016) has gotten a tremendous amount of attention in Finland, selling over 25,000 copies and receiving numerous awards (read more here). The most recent publication of the novel was that of Hanser in Germany, where the book has gotten supreme visibility in the bookstores.